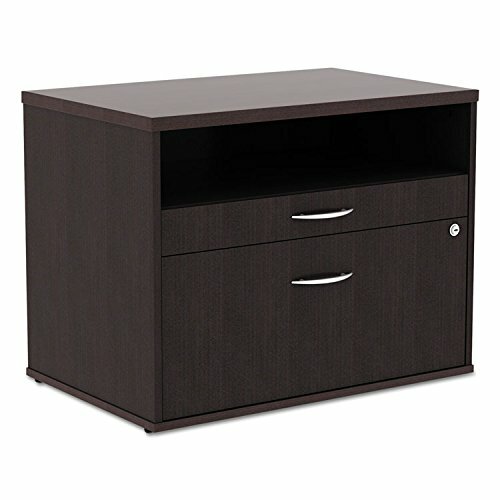 Sturdy low file cabinet great for use for storage or as a low credenza with your desk. Great used as a return to expand your desk space to create "L" or "U" shaped desk configurations. Coordinating laminates for use with Alera Valencia, Sedina, or Open Office Desk Series. Three storage spaces including lateral file drawer, pencil drawer and open storage. Full extension ball-bearing slides for easy access to everything. Configurable left or right handed. Durable woodgrain laminate is scratch-, dent-, and water-resistant. Leveling glides compensate for uneven floors. Two fold-away safety keys. Accommodates letter or legal filing. Color: Espresso; Overall Width: 29 1/2"; Overall Depth: 19 1/8"; Overall Height: 22 7/8". Sturdy low file cabinet great for use for storage or as a low credenza with your desk. Coordinating laminates for use with Alera Valencia, Sedina, or Open Office Desk Series. Three storage spaces including lateral file drawer, pencil drawer and open storage shelf.